.......53 Buddhas and Me .................My Life Adventures.....: "Knitting Needles"
OK, what do you do when you have a bunch of odd plastic knitting needles that you don't use anymore?? Well if you are Davine you obviously make bracelets. 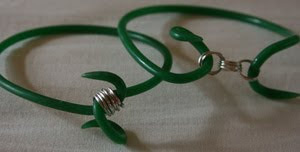 It was such good fun heating the needles up in the microwave for about 10 minutes, I was then able to bend then into any shape I wanted. Then me being me I was to impatient to wait for them to cool, of course I put them in the freezer. Then again me being Davine I had to add some jump rings and beads. What a fun way to spend a day, just playing and seeing what you end up with. 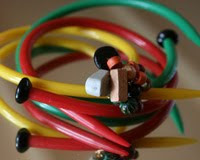 What a totally fun idea...... Maybe turning my few sets of knitting needles into bracelets would make better sense for me..... I've tried knitting on many occasions, and I never quite get the rhythm where I feel comfy with it. Crocheting comes more naturally. It's always fun to see the creative ideas of people. And blogging has allowed us to 'meet' so many wonderful creatives! Way too cool! Fantastic idea Davine, I love it! I love this creative idea! Years ago I relished doing this - making something cool out of seemingly nothing. It's a great exercise in seeing "beyond" what is! Thanks for the reminder of getting back to doing something like this. This kind of creativity is great soul food. Oh what fun! That's a neat idea! Such bright colors! I'm sure there are many things that one could do with such pretty knitting needles.